Rebekah Brooks, former chief executive of News International, arrives at Newbury racecourse in November. Police arrest six in dawn raids connected with News of the World phone-hacking scandals. 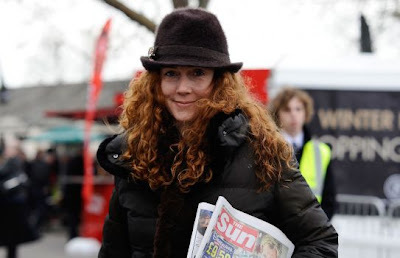 Rebekah Brooks, the former News of the World editor, and her husband were reportedly among six people arrested in dawn raids Tuesday connected with the phone-hacking scandals. Brooks, 43, the former News International chief executive, and racehorse trainer Charlie Brooks, 49, were arrested by detectives at their Oxfordshire home on suspicion of conspiracy to pervert the course of justice, the Brisbane Times reported. According to the Associated Press, the charge is an indication that investigators may be focusing on a possible cover-up of the scope of phone hacking at British publications owned by Rupert Murdoch. A spokesman for the Metropolitan Police, quoted by the BT, said: "The co-ordinated arrests were made between approximately 5 a.m. and 7 a.m. this morning by officers from Operation Weeting, the MPS inquiry into the phone-hacking of voicemail boxes." "All six — five men and one woman — were arrested on suspicion of conspiracy to pervert the course of justice, contrary to the Criminal Law Act 1977"
Brooks was arrested in July on allegations of conspiring to intercept communications and on suspicion of corruption. She was questioned for nine hours before being released on bail. Brooks stepped down from her role at News International, after presiding over the closure of the News of the World, at the center of outrage over revelations it had hacked the voicemail of a murdered British schoolgirl, Milly Dowler, 13. The arrests bring to 45 the the total number of held in Operation Weeting and related inquiries, the BBC reported.